Entangled electrical cables on Nguyễn Thượng Hiền Street HCM City’s District 3. VNS File Photo. HCM CITY - Local residents have welcomed efforts to put thousands of kilometers of electrical and telecom cables underground in HCM City. In late June, residents in Tân Bình District were frightened to see a big canvas sheet fall from a construction site onto an electrical transmission line on Phổ Quang Street. They were worried that an accident would occurr during the windy weather. Bùi Trung Kiên, director of Tân Bình Power Co., no incident was reported as all the electrical wires were covered with an electrical insulator. However, the company’s electricians had to cut the power off before removing the canvas sheet, causing a suspension of power supply in the area. Kiên said other electrical incidents had been caused by lightning strikes on transformer stations; trees falling down on electrical transmission lines; big trucks stuck on telecom cables; and broken electrical poles. The electrical poles carry electrical transmission lines as well as telecom cables. Many incidents have been caused by telecom cables affecting the electrical power transmission lines hung over these poles. Nguyễn Bách Phúc, head of the Institute for Electricity – Electronics – IT, said that no electrical transmission line was “absolutely safe” because lightning strikes, big trucks hitting line; and high trees falling down in rainy windy weather could occur without warning. The electric power industry must use the most advanced technologies to ensure safety for electrical transmission grids when they hang above the streets. There must be a system to immediately cut off the power in case a system is struck by lightning, according to Phuc. To reduce the impact from outside of the system, the best solution is to put the cables underground. The HCM City Power Corporation (EVN HCMC) began putting electrical and telecom cables underground in 2009. According to EVN HCMC’s statistics, the city has put nearly 2,800km of electrical cables underground, accounting for more than 39 per cent of the medium-voltage grids and more than 14 per cent of the low-voltage grids. 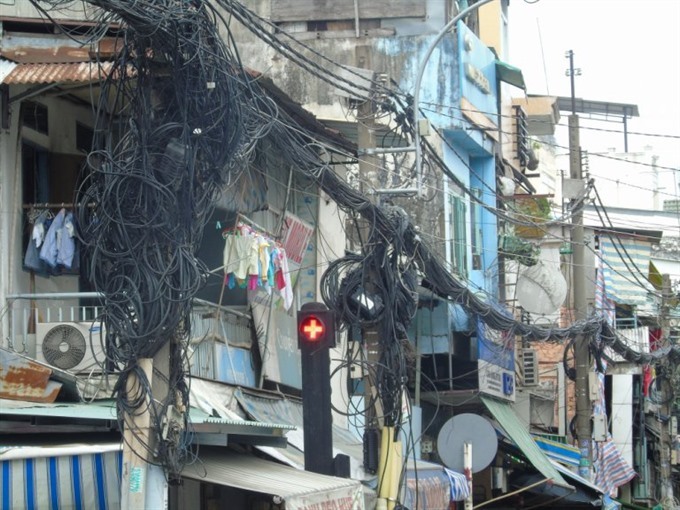 However, residents from suburban areas of HCM City still complain about entangled electrical transmission grids and telecom cables in their areas. Phạm Quốc Bảo, deputy director of EVN HCMC, said the electrical transmission lines in the city were put underground until 2020 as scheduled by city authorities. However, work on putting these grids underground have encountered challenges such as narrow streets hindering their work, and long-term negotiations with local residents about the equipment of these underground grids.